The whole Grubbs family traveled down to Terre Haute to participate in the 5th annual Vlasic Classic pickleball tournament. My family includes myself (Rocket’s son! ), my wife Abby (6 months pregnant) and my two year old son Brandon. Plus my mom and brother Zack and his wife Amy played as well. The weekend started out meeting Grandpa and GG in Indianapolis where we left a car to car pool the rest of the way to Terre Haute. We had to get to Terre Haute for the start of the 5.0 singles tournament late Friday afternoon. We got to the courts to set up our chairs under a shade tree and get Brandon familiar with the park. There was a playground and a basketball court perfect for Brandon to ride his four wheeler on. After warming up with the Rocket (dad), we wandered over to the scorer’s tent to check out the draw. I was in the opposite bracket as Dad and had to play three matches in the round robin format. I was glad for that, because with the heat being over 90 degrees, his wicked angles make you run…a lot. The singles tournament went on until sunset making it hard to see the ball. Play was suspended till the next morning at which I had to make a decision. Wake up at the crack of dawn and play some more singles or sleep in and concentrate on doubles? Having GG at the tournament who would get up with my son if he woke up early made the decision easy. SLEEP IN! The next morning, after a good night’s rest, we headed back to the courts to get ready for the start of the doubles tournament. My partner, Terre Haute resident and friend Brad Bilyeu, warmed up and got ready for what would turn out to be a long day. We started out in pool play and got off to a hot start both on and off the courts. The temperature that day was in the 90’s and felt even hotter on the court. Try telling a two year old to stay in the shade! We swept through the pool play without dropping a game. We even took two games off eventual champions Deli and Alvin Stinnett. After sweeping the pool play we received the number one overall seed for the single elimination shootout. We played well enough to get to the final four but ran out of steam. We definitely weren’t prepared for the dink fest that took place against Lynn Carlson and Al Hager. Now it was time to concentrate on the mixed doubles! Time for the fun to begin as I brought out my secret weapon! My wife is six months pregnant and one of the most competitive people you will ever meet. You don’t score 2,000 points in basketball and have your jersey retired at Bethel College without being a little competitive. After warming up Sunday morning the tournament director yells out the first matches, “Grubbs and Grubbs!” We all just sit there and laugh since I am playing with Abby, my brother is playing with his wife Amy, and my dad is playing with my mom. All Grubbs and Grubbs teams! The Grubbs’ are taking over! We finish pool play and received the third seed. Not bad for Abby having to carry a kid around in her belly and me on her back! When the single elimination brackets were posted we found out we would be playing the Rocket and GG. Now who is going to watch Brandon? Lucky for us there were about fifteen sets of grandparents who were missing their grandkids and jumped at the opportunity to watch Brandon even if it was only for twenty minutes. We played an episode of Mickey Mouse on the Ipad and headed out to the courts. Isn’t technology great! The match against mom and dad was a long hard fought battle but after a long weekend, youth eventually prevailed. GG wasn’t too upset because now she could just watch Brandon the rest of the time. Eventually we lost in the final four after a great day of pickleball with my wife. Abby was definitely the talk of the tournament with how well she played being six months pregnant. We had another great time playing in Terre Haute and spending time with family. Hopefully next time the Grubbs’ will bring home a little more hardware. 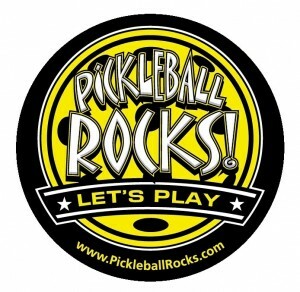 Pickleball Rocks Car Magnets Are Back !!!! Click Here to Get Yours Today! Back By Popular Demand. Click on the magnet below to order yours. I just returned from the strongest midwest pickleball tournament I have played in in my 5 years of playing. The 5th Annual Vlasic Classic in Terre Haute, Indiana. It started with the men’s singles on Friday at 5:30. Eight players entered the 5.0 draw which was divided into two round robin flights. Each match will be 2 games to 11. You receive a point for each game you win. Match time temperature? About 95. Ok maybe less, but it felt like it. Immediately I picked up on a foreboding sign. I only saw one player in the pack within 30 years of my age. Uh Oh!!! So I walked out onto the court,excited for my first match. Got off to a great start if you call a one hour singles match great. I was exhausted already. Round number two is against a 20-something former tennis player. No big deal, I’m a former tennis player too. Only challenge is I’m a 57 year old former tennis player. He seems a bit nervous playing against an old veteran like me and I slowly build a 10-2 lead in the first game. By this time, my chest is pounding pretty good and I’ve already burned my two available timeouts. And I think he senses I’m running on fumes. I jokingly offer to purchase one of his yet-to-be used timeouts, but he’s not selling. Anyhow, I’ll save you all the agonizing details of his comeback, but he wins the first game 14-12. Bummer. But with a few strategically placed ice cubes and armed with two new timeouts for game two, I put together a 11-6 second game win. I consider this match a victory even after blowing the 10-2 first game lead. Again, I methodically worked my way through the first game. I used every angle known to man as I tried find a way to get the ball past him, but to no avail. Two timeouts later, I lose the first game 11-8. But now I have a dilemna. I’m starting to get the chills, I can’t hear out of my left ear and my chest is pounding way beyond normal recovery time. Aaack! I hate getting old, but I know it beats the alternative. I grudgingly withdraw from the rest of the singles competition. End of day one. Day two I am playing with my youngest son Zack in his very first men’s double’s tournament. Again the 5.0 division is a two flight round robin format which will be used to seed a single elimination bracket tournament for the 3 medals. First match time temperature? About 105! Ok maybe less, but it was hot even at 9am. Let me say at this point, Zack is a great player and he played extremely well all day. And he did get his money’s worth since every team decided to test the new guy over and over and over again. We didn’t do too well in the long, long round robin, ( 1 win and 5 losses) but by the time we hit the main tournament draw we were ready. Not faring well in the round robin, meant we drew the number 2 seed as our first match opponents. No problem, Zack and I both played well and managed to force a good number of mistakes from two young guns from northern Illinois. Final score, we win 11-6, 11-6. On to the final four where we meet the defending doubles champions from last year. Father and son team Alvin and Deli Stinnett are always a handful and this time would be no different. This match started off on the wrong foot as Team Stinnett scores the first 6 points. Allowing the other team to grab a 6 point lead in a game to 11 points is usually not conducive to winning, but we took a quick time out and came backing firing on all cylinders. Final first game score? Good Guys 11, the other guys 6. We had completed a great comeback and the hopes of carrying the momentum into the second game. But no. We dropped the second game 11-8 and unfortunately the third game 11-9. Wish we could have squeezed that last one out to get on the medal stand, but overall a real good first showing for Zack and me. Finished up the long day around 8pm. Day three was time for mixed doubles. The Grubbs’ are well represented with Josh and wife Abby, Zack with wife Amy, and me and my bride of 35 years, Karen. Here’s a quick video to introduce you to the Grubbs family. First match temperature? About 125!!!! Ok, you get the point, it was a hot weekend. Karen and I went 1-3 in our round robin so we would ultimately wind up with a pretty bad slot in the single-elimination tournament. More on that in a minute. There are two main stories in the Grubbs family. One is the talk of the tournament as Josh and Abby, who is 5 months pregnant, are making life miserable for everyone. People are amazed at how well Abby is playing, especially when everyone else is wilting in the heat. Josh and Abby make it to the final four before bowing out in an amazingly entertaining 3 game match. But people are also talking about the other Grubbs girl. She comes out of nowhere to win the Women’s 3.5 Silver medal, teaming with Atlanta native, Pat Dunn. Zack and Amy made it to the final four, but because of a church commitment back in Fort Wayne, resigned early. Nice second tournament ever for them. They could be a force in the future. Back to Karen and me. So how did we bow out? By drawing the powerhouse of Josh and Abby Grubbs in the the first round, that’s how. We made a parental decision to hit basically everything to Josh so as not to wear our pregnant daughter-in-law out. Strategy worked great. Abby was fine at the end of the match and we were on the sidelines cheering them on, plus baby sitting our grandson while his parents played on. If you ever want to play in a great midwest tournament, the Vlasic Classic is the one. Pickleball Rocks in Terre Haute!